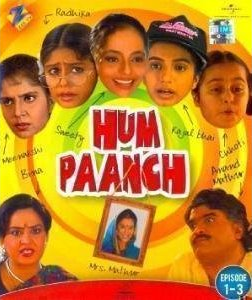 Let us continue our quest to review Hindi Sitcom Hum Paanch by exploring Episode #8 of the same. The episode is focused on Pappu and Dhanno’s incomplete love story which is about to blossom again! 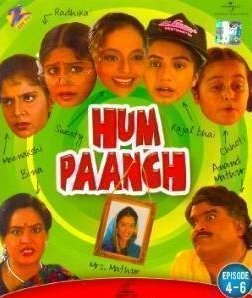 You might started thinking that the love story of Pappu and Dhanno might be interesting but what it have to with Mr. Anand Mathur and his family? Well, When you reach half way to the episode you will get to know the connection! This episode have some genuinely witty dialogs. For example see how Anand Mathur explains that: “In love (which is the area of heart), the eyes need to overwork. From establishing connecting to giving love signals to cry when the heart breaks!” It is good to hear the entire dialog on screen. The episode starts with Anand Mathur reading a newspaper accompanied by her wife Bina doing the routine home work. When Anand’s eyes caught a news about a lady who is a mother of two children, ran away with her lover; he shared the news with with his wife. Of course, he was disappointed. The conversation ultimately lead Anand to a point where he need to handover some money to his wife so she can bring their daughters for the shopping! How Anand escapes himself from going to shopping with them is a fun watch. The dialogs till now may not irk laughter but they simply spread genuine smile for sure. One complain we have for the DVD though. The background music and laughter are comparatively louder track and at various places it overpowers the dialogs too. It then gets tougher to hear the dialogs in such situations. Also the laughters coming in the background when even there is no funny dialog spoken. This is not proper. The editing could have been better to overcome the issue. Priya is charming when speaking from frame (as Anand’s first wife), but the way she tries to prevent Anand from getting relaxed is not sounding funny. This episode introduces one guest actor. A college friend of Anand named Pankaj Malhotra. Their conversation is written nicely. The dialog writer(s) are able to put some punch lines thoughtfully. We got to know that Pankaj is an IAS office who came to the city for some official work. He is unmarried yet, but he had fallen in love with a girl of his village in his very young days. Unfortunately when he came back from IAS training the girl was got married to someone from Anand’s city! Anand promises him to help him in finding her. The family which went for shopping came back and Pankaj was shocked by seeing so large family. He comment about family planning here. As the entire episode is shot on the set, it is a kind of challenge for the cameraman to keep the things look attractive on the screen. The lighting is an aid to him. As both these segment were worked on sincerely, the output is decent. Also – the food on the dining table – scene shows you how Indians treat their guests. The Antakshari scene at the end is fantastic. The way Anand got emotional and walks away by saying “excuse me” is fantastically funny. Also the dialog of Kajal after that scene “how can one win any match after Kapil Dev got retired” is quite thoughtful. It also shows the attachment of sports, especially cricket in domestic life in India (and but of course, the place of legendary player Kapil Dev in sports lover’s heart too). The conclusion scene shows about family values and priorities in life. Which makes the episode worth watching.